Locally, nearly 350 pounds of turkey and nonperishable items were collected during the two-week drive, which ran from November 2 to 16. San Antonio team members delivered the items to the organization to distribute to families in time for the holiday, providing 275 meals. “There is nothing quite so satisfying for our company and our community families to donate food to those in need. Hopefully, we made their Thanksgiving and their year a little brighter,” said Tracy Stockton, Senior Sales Consultant for David Weekley Homes. In San Antonio the Thanksgiving Drive benefitted San Antonio Food Bank, an organization that provides food and grocery products to more than 530 partner agencies in 16 counties throughout southwest Texas. “Thank you for helping us feed 58,000 individuals each week. Your support and generosity with your food drive brought in some of our most wanted items. We couldn’t do it without you,” said Eric S. Cooper, President and CEO of San Antonio Food Bank. 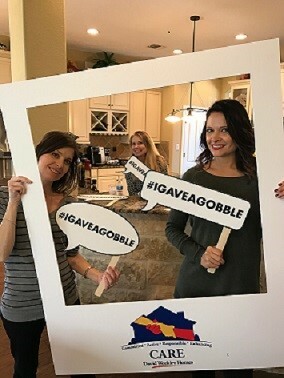 Team members from David Weekley Homes pose for their photo featuring the #IGAVEAGOBBLE message. In Fiscal Year 2015, the San Antonio Food Bank provided nearly 62 million pounds of food. The mission of the SAFB is to fight hunger in Southwest Texas through food distribution, programs, education, and advocacy. They strive to maintain the highest standard of efficiency while providing food to those in need. Ninety-eight percent of donated resources go directly to food distribution programs. The San Antonio Food Bank has consistently received the highest 4-star rating from Charity Navigator.